What is the significance (if any) of a Shrine emblem pin having a star included in the design and not having a star included? 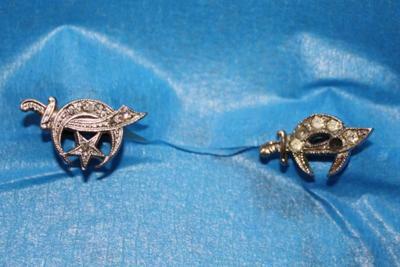 Please see the photo of two pins which shows the different designs. All the Shrine emblems that I have seen, including those on Masonic jewelry, fezzes, bumper stickers, Shrine rings, etc. include the star as part of the emblem. I do not know of a specific meaning for the emblem to be without the star. Typically, the emblem is formed with the crescent, (which is analogous to the claws of a Royal Bengal Tiger), upon which is the head of a sphinx. Behind the sphinx is a pyramid. Beneath the sphinx head hangs the star. The crescent hangs from a (usually) horizontal scimitar. It is possible that the jewelry designer simply took a bit of artistic 'license' with the pin which does not include the star. Hope this has been helpful. If anyone else is aware of a specific meaning for this Shrine emblem pin not to include the star, please share your information by using the form.